It was just 5 months ago we shipped Silverlight 3. Last week at PDC, Silverlight 4 Beta was introduced. The rapid release cycle allows the team to act quickly based on developers feedback and to keep pushing Silverlight to be the best platform for delivering rich interactive and media content on the web. In Silverlight 4 Beta, I see more end-user features that were only available to client applications before. For example, Silverlight 4 supports right-click context menu, drag-drop from desktop to Silverlight app, and multi-level redo and undo. This allows users to transfer their knowledge of using client applications to the web. Device access support such as WebCam support will bring more richness to web applications. For instance, instead of sharing something with your friends on the web through a text email, you can send a video clip. The possibilities are endless. My colleague Joey DeVilla has a nice post on the Developer’s blog on Silverlight 4 features and resources. The best way to get an overview of Silverlight 4 is to watch Karen Corby’s PDC talk “Microsoft Silverlight 4 Overview.” Karen has many interesting demos in her talk to showcase Silverlight 4 features that you can download and play with from her blog. 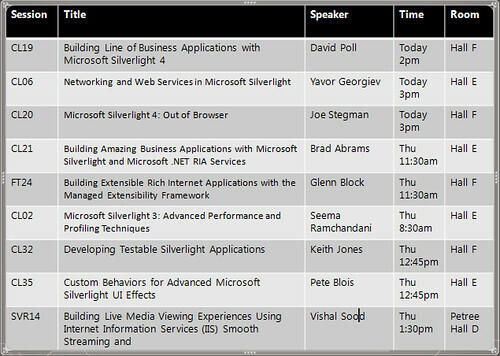 To get more details of a specific area of Silverlight 4, you can watch one of these PDC Silverlight sessions.